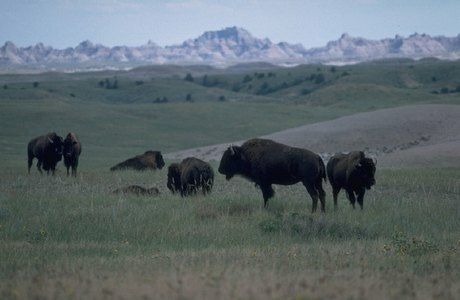 Badlands National Park consists of 244,000 acres of sharply eroded buttes, pinnacles and spires blended with the largest, protected mixed grass prairie in the United States. The Badlands Wilderness Area covers 64,000 acres and is the site of the reintroduction of the black-footed ferret, the most endangered land mammal in North America. The Stronghold Unit is co-managed with the Oglala Sioux Tribe and includes sites of 1890s Ghost Dances. Established as Badlands National Monument in 1939, the area was redesignated as a National Park in 1978. Over 11,000 years of human history pale to the ages old paleontological resources. Badlands National Park contains the world's richest Oligocene epoch fossil beds, dating 23 to 35 million years old.